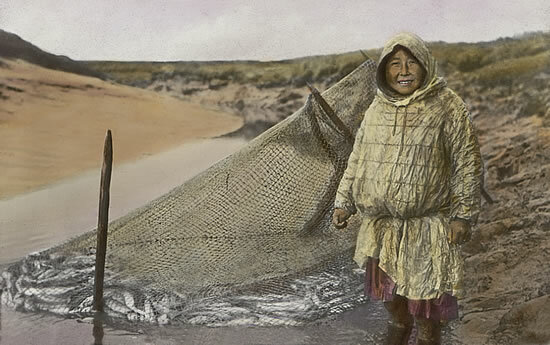 Uliggaq (Ella Pavil), dressed in a seal gut parka and dipnetting for tomcod in a slough near Kwigillingok in the 1930s. Paul John-am grandma-llra caperrnarqellruuq arnaq. Uksuarmi kumlanerkareskuni ivrumaluni, qalu civvluku ceturrnassuun, imarnitegnek qallirluni. Ugayarluteng pituut, keggateteng taugaam ukut yuuvkenaki. Qalumek civcissaakuni, cikuq agiireskan cingluku ayagtaqluku. Paul John's grandmother was an amazing woman. In fall when she got fish to freeze, she'd be standing in water, and she'd set the tomcod net in the water, wearing only a seal-gut parka. They would take off their garments below the waist but keep the upper garments on. 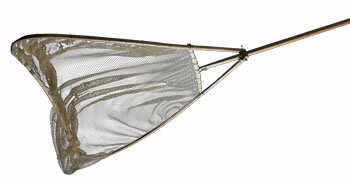 While setting her dip net, if a chunk of ice came her way, she'd push it away. 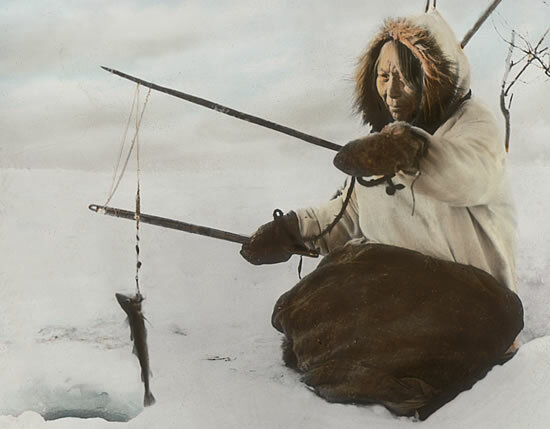 Many elders recalled with admiration the stamina of their mothers and grandmothers, who stripped to the waist and waded into ice-cold tundra streams to drive fish into nets during fall runs. Frank Andrew exclaimed, "They are dipnetters from Kwigillingok. 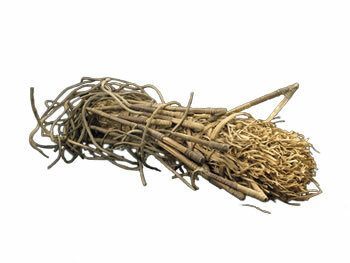 They are my ancestors. These are their handles down in the water. These are the grass storage bags filled with tomcod that are being frozen. These people are pulling the net out of the water." Along the coast, both men and women continued dipnetting for tomcod under the ice after freeze up, helping each other pull up the heavy nets. 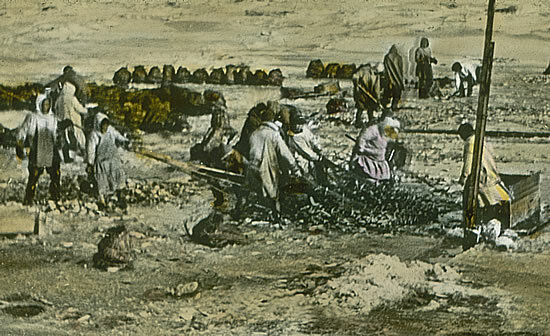 People only stopped dipnetting after an hour or more, when the weight of the fish caused the ice to slant toward the middle of the river. They would resume only after moving the fish, which they stored as food for both dogs and people. Frank Andrew noted, "They watch them closely to determine when to pull them out because they are unable to pull them out when they get too full." Burbot hooks from the lower Yukon River. Frank Andrew explained: "These have little, sharp points, shaped like small gaff hooks used for hunting burbot. They had lead lines with baited hooks like these which were set below ice, held in place with a stick across the hole, and checked later." 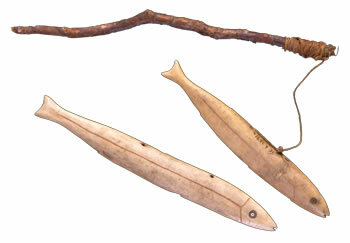 Fish lures made of bone and used in the Yukon area. They were usually attached to a rod and moved back and forth on the water's surface, attracting pike and other big fish, which were then speared. Nuusaaq/Pike spear from Bristol Bay. Woman fishing for tomcod through the ice, jigging her line up and down to attract the fish. 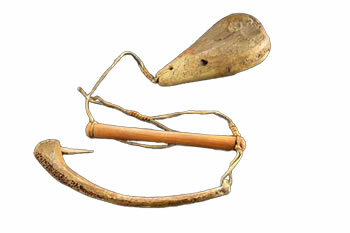 Tomcod hook and bone sinkers from Nunivak.